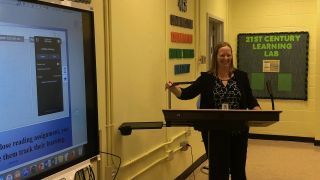 Shelby County Schools (SCS) in Memphis, TN recently installed HoverCam’s Pilot digital teaching station and CenterStage Interactive Flat Panels (IFP) in the district’s technology training lab and some classrooms. As the district plans to open two new schools next year, SCS chose HoverCam’s education solutions as part of its new technology infrastructure that’s designed to support teaching and learning in the 21st century. With more than 170 schools, SCS sought out HoverCam technology as a new tool to help educators achieve its five priorities: strengthen early literacy; improve post-secondary readiness; strengthen teachers, leaders, and central office staff to drive student success; expand high-quality school options; and mobilize family and community partners. HoverCam’s Pilot and CenterStage IFP education solutions checked all those boxes. Currently, the HoverCam solutions are installed in a number of classrooms as well as the technology training lab. HoverCam will also be the centerpiece for every classroom within the district’s two new elementary schools expected to open in the fall of 2019. The Pilot mobile teaching station is designed to solve the operational and management hurdles that educators face when new devices are put in the classroom by combining the most important audio, video, and digital content elements used today in a mobile podium. The design eliminates the need for an AV cart while freeing teachers from stationary desks or lecterns. It integrates a Windows PC, 13MP document camera, and 21-inch touchscreen with wireless HD mirroring functionality so any device content and touch annotations can be beamed to any IFP, projector, or TV in the room. The document camera’s built-in microphone enables educators to capture audio. And with HoverCam’s ClassFusion classroom management software, every lesson, interactive whiteboarding, annotation, and desktop marking can be recorded and saved to the cloud for students to access anywhere, anytime, and from any device or browser—making it the perfect solution for flipped and active classrooms that encourage creative thinking. HoverCam’s CenterStage series of 4K UHD IFPs represent the convergence of quality, functionality, and affordability. It provides all the features educators have come to expect in an IFP, such as responsive multi-touch functionality, Android OS with app installation, and customization capability. CenterStage complements HoverCam's Pilot teaching stations and is available in 65-, 75-, and 86-inch models.